Service-Learning Project Ideas Related to Environmental Justice: This toolkit will guide instruction and provides ideas for service project ideas and community resources. This is designed to spark ideas for learning and actions related to understanding and impacting environmental justice. Working with a partner organization, research a local environmental issue and its impact. Create a fact sheet for school and community use. Join and support your school’s “green team." Organize projects to make students aware of healthy habits and actions they can take that sustain the environment. If an environmental club doesn't exist, start one. Organizations listed in Community Resources below can be of help. Find out what volunteer events are happening in your community, and join in. Invite experts from the community to present at your school. Some of these organizations are identified in Community Resources below. Attend a local event about improving neighborhoods or the local environment and tell others about what you learned. Visit your elected representatives to let them know what you want to see changed. Take a position, practice writing and saying what you want to impact, and be an advocate for change. Create a PSA including information about your cause. See the Community Resources below. Learning to Give lesson plans teach students about philanthropy concepts and advocacy skills. Learning to Give lesson plans teach about environmental justice and the environment. Introduction to Philanthropy Lessons - Introduce age-appropriate definitions and concepts at each grade level. Want students to identify community assets? Try building a Community Map. Locate local nonprofits via GuideStar.org. Bring community awareness to your students' work by using this step-by-step media and timeline guide. Environmental Service-Learning Toolkit All grade levels. This toolkit includes project ideas, links to lesson plans, and resource links. Be The Change: Environment Three lessons, grades 9-12. Students explore environmental issues and discuss ways to take social action to raise awareness of environmental stewardship. Water Quality, Community Action and the Flint Crisis All grade levels. Project ideas, resources, and links to lesson plans selected and adapted by Flint teachers. Environmental Groups and the Three Economic Sectors Three lessons, grades 9-12. Students explore how the three economic sectors--for-profit, nonprofit, and government--each contribute differently to protecting environmental interests. See the handout below for additional teacher-focused background information and sources. The Detroit Climate Action Plan: Adopted in October 2017, the Plan was developed by a lengthy collaboration of citizens, nonprofits, business and government. It addresses a complex set of actions to be taken by various segments of the community. 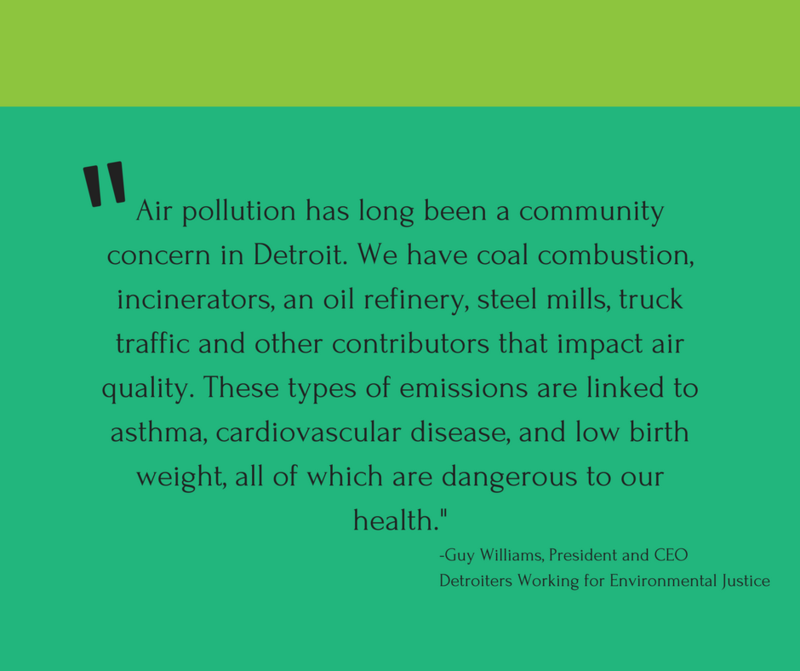 The Detroit Environmental Agenda is a coalition of 20 local nonprofits committed to environmental justice. Its highly-visual July 2013 agenda report is a wealth of data and graphs. Tox Town, from the National Institutes of Health, is an interactive overview of toxins found in various locations in a City environment. EJSCREEN: This screening and mapping tool from EPA combines environmental and demographic indicators in maps and reports based on address or place. The Detroit Public Schools Community District Go Green Challenge is a voluntary opportunity for schools to reduce their energy costs and share in the savings. Over the past 5 years the program has saved over $1,700,000 and awarded $112,000 back to schools. For more information on the DPSCD Go Green Challenge or to sign up to participate in the program, email dps.gogreen@detroitk12.org. The Center for Urban Responses to Environmental Stressors, headquartered at Wayne State University, works to understand how human exposures to chemical and non-chemical stressors in the urban environment can influence the development of environmentally-linked disease. In furtherance of a healthy Detroit, CURES has a strong commitment to informing and learning from the community by providing guided environmental health tours and mobile education outreach on topics including lead, asthma and indoor air quality. Contact Outreach Coordinator Brian Smith at 313-577-5045 brian.smith9@wayne.edu. Clean Water Action: Founded in 1972, Clean Water Action “organizes grassroots groups and coalitions, and campaigns to elect environmental candidates and to solve environmental and community problems.” In Michigan, CWA’s campaigns include getting lead out of drinking water.